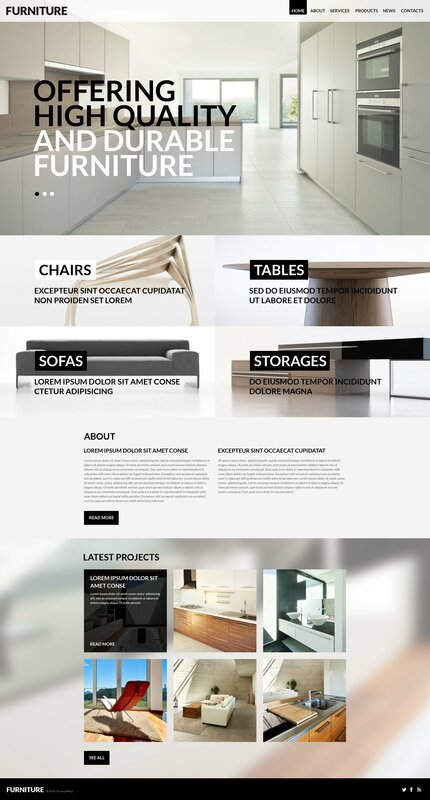 Lightweight and modern theme with unobtrusive layout and intuitive navigation will effectively present any company that deals with furniture production. Focusing attention on large visuals, this design highlights the products upsides, thus promoting the company effectively. Black white legible fonts make the content readable, offering to read the general information about items, thus helping visitors make their choice. To turn all this into reality, make use of this theme. If you purchase the product at a â€˜Unique price' it guarantees that you are the first and the last person to buy this WP template for Designers from us. It means that this template has not been sold before and you become an owner of a unique design. After this kind of purchase the template is being permanently removed from our sales directory and is never available to other customers again. The unique purchase license allows you to develop the unlimited number of projects based on this template, but the template should be customized differently for every project. If you purchase the product at a â€˜Buyout price' it guarantees that you are the last person to buy this template from us. It means that this WordPress template for Interior & Furniture Supplies may have been sold before a couple of times (see â€˜Downloads' number in item's properties) but only you and people who bought the template before you will own it. After this kind of purchase the template is being permanently removed from our sales directory and is never available to other customers again. The buyout purchase license allows you to develop the unlimited number of projects based on this template, but the template should be customized differently for every project. After WP theme for Design Studio purchase you can put your copyright to the template. But you cannot place a line at the bottom (or any other spot) of the customized project saying "Website design by Company name". Nevertheless, you can place "Customized by Company name". I used this template for a small company in construction business, called Tra&ccedil;o Construtora . You can visit the site at this URL tracoconstrucao.com.br I&rsquo;m a brazilian webdesigner, running a small business at my country. Template Monster has been a amazing supplier, providing me many Wordpress templates, i can delivery the job before the deadline and my clients are very satisfied so far. Template Monster support is very good, and reach our expectations as well. Cherryframework allow us to have many great effects and features, i recommend you to keep update due the old version security issues. The SEO and responsive settings ia good, and this template is easy to customize. I have no complains to this template. Very good price, i will recommend to all my webdeveloper friends. Firstly, I was searching for black-white theme, and this template is exactly what I need. While I was installing, I had some doubts about proper working of this web-site. The theme was installed successfully, and this theme is amazing, I adjust all needed points without any issues. Wordpress CMS is so googd in use, all content laid in way, which I desired. From other side, you need crop all images for gallery for special size, otherwise gallery looks inaccurate. Despite this drawback, i rate it 5 stars. The last template I bought has all that I need to make great web site for my client. I had been worked with templatemonster since 5 years, and I have to say that they are a great partner for my small business. The great value of them is the after sale service they offer. I recommend them 100% !!! My clients adored the final outcome, and that is what I always strive for - happy customers. Great theme. As the agency for a furniture maker, I was pleased to find this theme. The parallax responsive theme has a simple minimalism, but looks very &quot;tech.&quot; Nice theme! Can I edit this template with MotoPress CMS? In the portfolio with format slideshow, how can I add the images for the slide?